Olivier Hyvernaud reported that recent T-phase waves, recorded by the Laboratoire de Géophysique in Tahiti, originated from near Curtis Island (figure 1) and had waveforms suggesting a volcanic origin. The first of these hydroacoustic waves recorded on the Polynesian seismic network were a brief swarm of seven short strong events on 17 January 2009. On that day the network received the signals between 1706 and 1717 UTC. In addition, a single event was received 19 January 2009 at 0753 UTC. The best preliminary location for these events was 30.49°S, 178.55°W, a position 5-6 km NNE of Curtis Island and well within the area of the larger caldera structure. Figure 1. Satellite imagery showing Curtis and Cheeseman Islands (inset) along the Kermadec Island chain north of New Zealand. Curtis Island is approximately 900 km NE of New Zealand. Volcano locations from GVP database. Inset map image acquired 10-11 May 2006 by DigitalGlobe. Imagery courtesy of Google Earth. On the New Zealand GNS Science website there is a brief discussion and two photos of Curtis Island, noting a short visit there, thermal activity, nearby mineral-rich volcanoes, and that it lies adjacent to a chain of submarine volcanoes (eg. Smith, 1988). They also stated "The benefit in studying this remote outcrop is the insight it gives into the composition of these underwater vents, while being relatively straightforward to measure in comparison." On 1 April 2009 Brad Scott (GNS) added that they were not aware of any activity at this time. The island is remote and GNS personnel do not visit on a regular basis. The activity on the island is solfataric. He also noted that the island is composed of pyroclastic-flow (ignimbrites) deposits from an unknown nearby source. No thermal alerts have been measured by the MODVOLC system for Curtis Island since at least the beginning of 2004 and through 1 April 2009. References. Smith, I., 1988, The geochemistry of rock and water samples from Curtis Island volcano, Kermadec group, southwest Pacific: Journal of Volcanology and Geothermal Research, v. 34, no. 3-4, p. 233-240. Information Contacts: GNS Science, Wairakei Research Centre, Private Bag 2000, Taupo 3352, New Zealand (URL: http://www.gns.cri.nz/); Olivier Hyvernaud, Laboratoire de Géophysique, Commissariat a l'Energie Atomique (CEA/DASE/LDG), PO Box 640, Papeete, Tahiti, French Polynesia; Hawai'i Institute of Geophysics and Planetology (HIGP) Thermal Alerts System, School of Ocean and Earth Science and Technology (SOEST), Univ. of Hawai'i, 2525 Correa Road, Honolulu, HI 96822, USA (URL: http://modis.higp.hawaii.edu/). The Global Volcanism Program has no Weekly Reports available for Curtis Island. The Global Volcanism Program has no synonyms or subfeatures listed for Curtis Island. Curtis and nearby Cheeseman Islands are the emergent portions of a submarine volcano astride the Kermadec Ridge. The age of the small islands are considered to be Pleistocene, and rocks consist dominantly, if not entirely, of andesitic pyroclastic-flow deposits (Lloyd, 1992). Curtis Island, only 500 x 800 m in diameter, contains a large, fumarolically active crater whose floor is only 10 m above sea level. Reports of possible historical eruptions probably represent increased thermal activity. Geologic studies have documented a remarkable uplift of 18 m of Curtis Island during the past 200 years, with 7 m of uplift occurring between 1929 and 1964 (Doyle et al., 1979). An active submarine magmatic or solfataric vent is believed to exist nearby, but its activity cannot unequivocally be associated with the volcano (Lloyd, 1992). Doyle A C, Singleton R J, Yaldwyn J C, 1979. Volcanic activity and recent uplift on Curtis and Cheeseman Islands, Kermadec group, southwest Pacific. J Roy Soc New Zeal, 9: 123-140. Latter J H, Lloyd E F, Smith I E M, Nathan S, 1992. Volcanic hazards in the Kermadec Islands, and at submarine volcanoes between southern Tonga and New Zealand. New Zeal Ministry Civil Defense, Volc Hazards Inf Ser, 4: 1-45. Lloyd E F, 1991. Curtis volcano, Kermadec Group, a review and reinterpretation. Volc Seism, 1991(1): 117-121 (English translation 1992, 13: 128-134). Lloyd E F, Nathan S, 1981. Geology and tephrochronology of Raoul Island, Kermadec Group, New Zealand. New Zeal Geol Surv Bull, 95: 1-102. There is no Deformation History data available for Curtis Island. There is no Emissions History data available for Curtis Island. 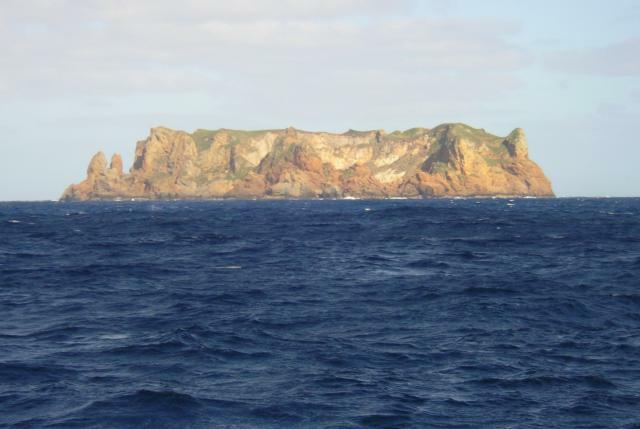 Flat-topped 137-m-high Curtis Island, seen here from the north, is, along with nearby Cheeseman Island, the uplifted portion of a submarine volcano astride the Kermadec Ridge. The small Pleistocene islands consist mostly of andesitic pyroclastic-flow deposits. Reports of possible historical eruptions probably represent increased thermal activity from a shallow crater near sea level. Geologic studies have documented a remarkable uplift of 18 m of Curtis Island during the past 200 years. The Global Volcanism Program has no maps available for Curtis Island. There are no samples for Curtis Island in the Smithsonian's NMNH Department of Mineral Sciences Rock and Ore collection. Large Eruptions of Curtis Island Information about large Quaternary eruptions (VEI >= 4) is cataloged in the Large Magnitude Explosive Volcanic Eruptions (LaMEVE) database of the Volcano Global Risk Identification and Analysis Project (VOGRIPA).